Happy Holidays from our family to yours! This is this year’s Christmas tree, trimmed by The Kid! Merry Christmas from Casa de la Cooking! I’ll be offline as I take a much needed break. See you in 2014! Remember the tale of the Stone Soup? This year’s wreath is the equivalent of that. I had already my wreath all planned out, when I discovered that those lovely hay wreaths I bought last year were sold out in the size I wanted them. 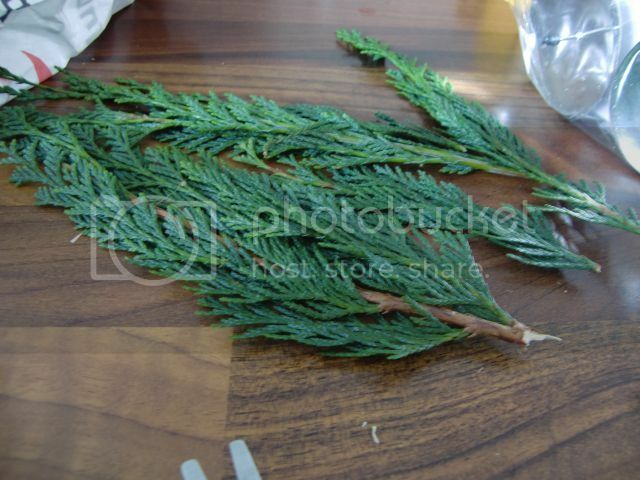 I had already bought two boughs of pine leaves, so what to do? I took two switches of pine, and bundled them together with a thin green craft wire. Added two more switches about 10 inches from the base of the first switch, and roll the wire around the leaves to hold them in place. Repeat the process and bend the boughs into a wreath. The wire should snake around the boughs as support to keep the shape. It wasn’t exactly round, and it had more of an oblong shape. It turned out fine in the end. Taking a square plastic fruit dish, I put a cork coaster over it as a base for the four candles. I always buy candles when they are on sale, so I didn’t need to buy anything extra. The dried-up apples came from my kitchen counter from this year’s harvest, so I was glad to find a use for them instead of throwing them away. The cinnamon sticks and star anise also came courtesy of the kitchen pantry. The pine cones came from the park, so did the walnuts. It turned out great, using materials I already had around the house. I was really glad I found a way to use them apples! 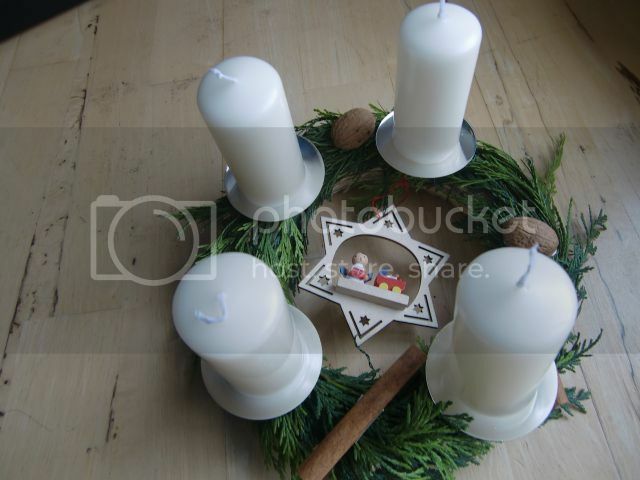 The first advent week means a massive spike in the electricity consumption of German households. No, not because of Christmas lights that can be seen from the moon (although my neighbor is an exception), but because German women, like their mothers before them, go into a cookie baking frenzy. They fill tiny plastic bags with cookies, wrap it up in nice ribbon and trade them with each other, like kids do with trading cards. A completely pointless and cute tradition, something that is repeated in summer, but with jam jars. I really enjoy baking Christmas cookies every year. Due to time constraints, (my kid), I haven’t been able to get to it until the last week of advent. But better late than never! It took me five evenings to bake the cookies, baking one kind of cookie at a time. This year’s cookies are a mix of Filipino/Hispanic, German, and American cookies, a reflection of my life so far. I could never really get the cookies to the tiny, bite-sized Plätzchen that the Germans trade with each other, since calculating how much the cookies spread had never been my specialty, though I got really close this year! Lengua de Gato, or Cat’s Tongue cookies, are European in origin. They are however beloved in the Philippines, where I had my first taste of these thin butter cookies. I am pleased with this year’s batch. They look very good, but I would definitely work more on it to get the consistency I like. I’ll keep you posted when I come up with my definitive version! This year’s Chocolate Chip and Totally Chocolate Chip cookies have also a Philippine component to it, as I used Philippine Muscovado sugar instead of soft brown sugar. A gift of walnuts from this fall meant that these were filled with walnuts instead of the traditional pecans. Chocolate crinkles are traditionally American, but are also very popular in the Philippines. Even the corner bakery where you get your pan de sal have these now, although most of them are baked rock hard. I am very happy with how the crinkles turned out this year! They are very airy and chewy, just how they are supposed to be. Vanille Kipferl are traditional German Christmas butter cookies made with flour and ground hazelnut or peanut, powdered with confectioner’s and vanilla sugar. Black and white cookies are also German butter cookies. The dark parts are colored with cocoa, and are usually baked in different patterns. This year my chessboard pattern didn”t really work, and turned into spotted cow flecks. Not bad! I’ve filled four tins full of cookies. If you send me postage I can send you some, or better yet, bake your own! I didn’t grow up with the smell of pine filling the air during Christmas, perhaps this is also the reason why I am not so attached to Christmas trees, unlike many Germans I know. For some people, a pine tree is a MUST for Christmas, and some go so far as to insist on using BURNING CANDLES instead of electric lights for their Christmas tree. My first Christmas here was spent nervously eyeing the candles on the tree. (Yes, electric lights can be dangerous, but I feel that the risk is much, much less!). I also gave my Mother-in-Law a long, hard incredulous look when she told me that the tinsel she used were partially produced with lead. she inherited it from her family. Yikes. But I digress. I am perfectly content with a plastic tree. One must think I’m nuts for this, but think about it. The pine tree you are using took ten years to grow, whether in a Christmas tree farm, or in the forest where you, my friend, have illegally cut it from. All that work for one day where the tree is to be cut down and turned into wood chips three weeks later. I know some people feel guilty for it, since I would often see trees of Christmas past in the front yards and empty spaces of German homes and offices. From what I understand, some pine species are very invasive, edging out local tree varieties and threatening the variety of forests, vital to a healthy ecosystem. Pine trees have a special chemical in their sap that prevent any other species from growing in their vicinity, including other pine trees. Speaking of variety, I am also wary of monoculture, which is effectively what Christmas tree farms are: the monoculture of pine trees. 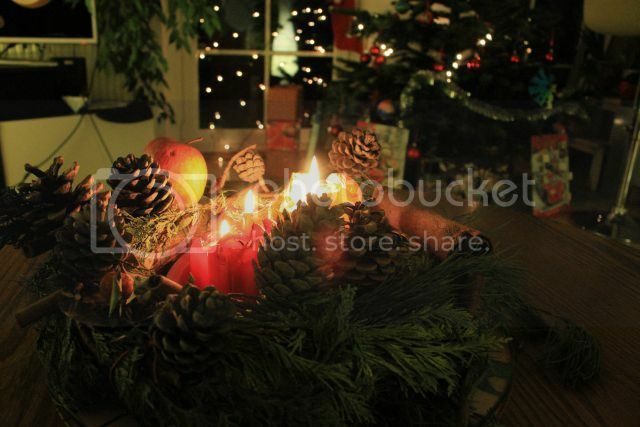 For those who can’t live without that pine smell, how about getting a potted Christmas tree? 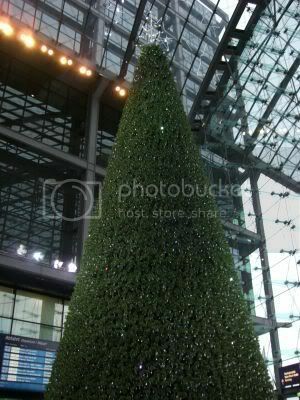 I think it is more ecologically sound than getting a cut pine tree year after year. Maybe even better than using a plastic one. What do you think? Vanilla Sugar or Vanilla Extract? So, we’ve been beset by Christmas cookie baking season. I’m also late in the game, and I plan to change that this weekend. I grew up in the Philippines using Vanillin, which is artificial vanilla extract. It is quite ironic, since we could grow vanilla in the Philippines. I used it to bake cookies, to flavor drinks. In Germany, I was able to get my hands on the real thing, at Xenos, of all places. Xenos is a Dutch-owned chain that sells cheap, classy looking Chinese crap (excuse my French, but products aren’t really great), and some exotic food items. However, Germany is not vanilla extract land. Over here, they use vanilla sugar. in fact, vanilla extract is hard to find in stores in Germany. Over here, vanilla sugar reigns! 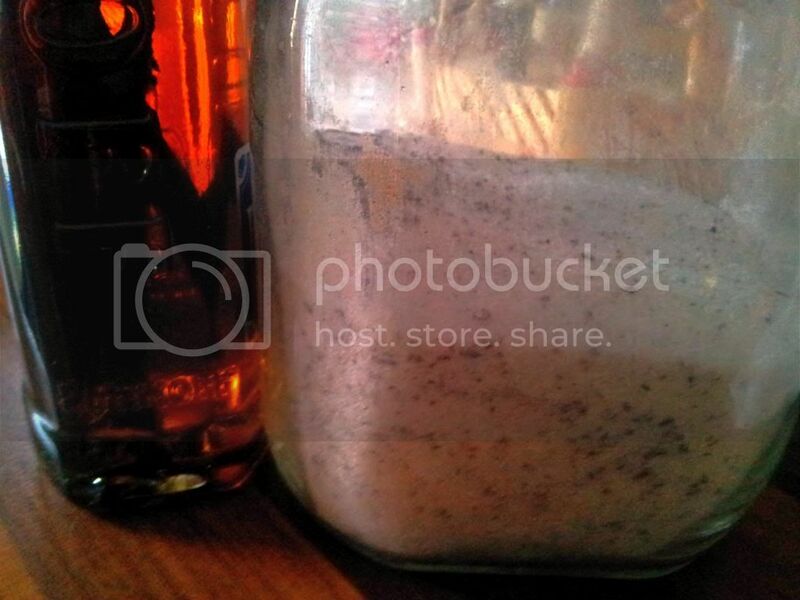 Ever since I found a super recipe for making my own vanilla extract, I’ve never looked back. Reformhaus in Germany doesn’t tempt me anymore with its overpriced vanilla extract. A vial of good vanilla beans with 2 pieces in it can set you back 5 euros, way cheaper than 7 euros for 100 ml of vanilla extract. This is literally the never ending vanilla extract. It will last you for years. So when I bake American, I use vanilla extract. But since I developed full-blown baking fever in Germany, I also have a lot of German recipes that use vanilla sugar. I think this is a great option for people who can’t eat/drink anything with alcohol in it. I don’t understand why so many people buy vanilla sugar in those 50 g packets, when making your own is so much more cheaper! Many people make their own vanilla sugar by throwing in two vanilla beans in an airtight container full of sugar, but I prefer Jaime Oliver’s recipe. In Jaime’s book The Naked Chef, he recommends blitzing 4 vanilla beans in a food processor, scraping the black gunk from the sides, and adding 1 kg of white sugar. Blitz it again and sieve. Blitz what remains in the sieve again in the food processor until you get a brown-grayish mass. While shopping for gifts, I saw some wonderful hay wreaths that can be used as a base for a Christmas wreath, and they looked so nice that I wanted people to see the base and not completely cover the whole thing. 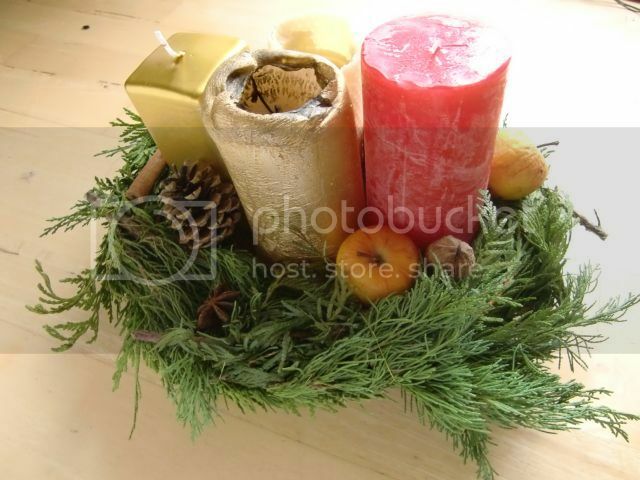 After that I bought candle holders to stick into the hay wreath, candles, cinnamon sticks for decoration, and a switch of pine leaves. I found walnuts around the house and used that for decoration, too. First, I cut off segments of the pine switches. Then I fastened the twigs onto the wreath using floral wire. If you don’t have enough wire or you aren’t coverting the whole wreath, you could fasten the wire onto the wreath by sticking both ends into the hay. Repeat the process until you cover the wreath, segment by segment. When you are done covering the wreath in pine, you could stick in the candle holders, strategically covering the areas where the wire is visible. Popular decorations on German Christmas wreaths are dried citrus fruits, nuts, pine cones, cinnamon sticks and red berries. Another dilemma presented itself with the branches themselves. What to do with the extra tough branches? 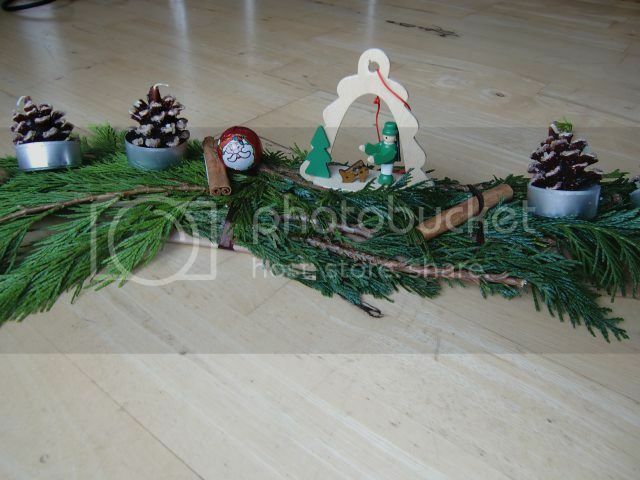 Good thing I had enough and made another Christmas decor with it using these cute pine cone tea lights I found. To add to my insufferable hippie cred, I’d like to point out that the ribbon used to fasten the pine branches is recycled from the candle’s packaging, and so is the cardboard base. I was two weeks late in making my Christmas decorations, but so what? They look great in the dark, and I’d try to make them every year from now on.